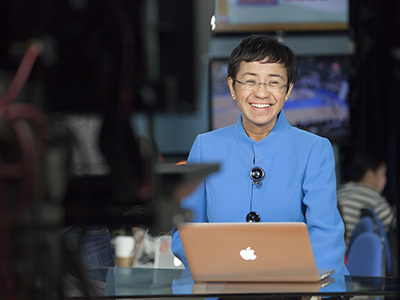 Journalist Maria Ressa is the recipient of the 2018 Free Speech Award, presented by the Newhouse School’s Tully Center for Free Speech. Ressa, who is CEO and executive editor of The Rappler, will visit campus for the award ceremony on Wednesday, April 24, at 1 p.m. in the Miron Room, 303 Newhouse 1. The center will also recognize late Washington Post columnist Jamal Khashoggi at the ceremony. Ressa was chosen from a pool of outstanding journalists from around the world who have faced significant turmoil in performing journalism in the previous year. A native of the Philippines, she has been harassed, indicted and arrested several times because of her critical coverage of Filipino President Rodrigo Duterte. “Maria represents an important voice and delivers important news at a critical time in the Philippines. She does this under constant threat to her freedom and safety,” says Roy Gutterman, associate professor of magazine, news and digital journalism and director of the Tully Center. In 1987, Ressa co-founded the independent production company Probe. In 2005, she managed ABS-CBN News and Current affairs, the largest multi-platform news operation in the Philippines. Her work aimed to redefine journalism by combining traditional broadcast, new media and mobile phone technology for social change. Ressa has been honored around the world for her courageous and bold work in fighting disinformation, “fake news” and attempts to silence the free press. This year, she won the prestigious Golden Pen of Freedom Award from the World Association of Newspapers and News Publishers (WAN-INFRA); the Knight International Journalism Award from the International Center for Journalists; the Gwen Ifill Press Freedom Award from the Committee to Protect Journalists; the Journalist of Courage and Impact Award from East-West Center; and the IX International Press Freedom Award from the University of Málaga and UNESCO, among others. For the Tully Award, a slate of journalists is nominated by outside press freedom experts and advocates and selected by a group of Newhouse students and faculty. Communication Access Real-time Translation (CART) services will be available. For more information or if additional accommodations are required, contact Audrey Burian at 315.443.1930 or aaburian@syr.edu.